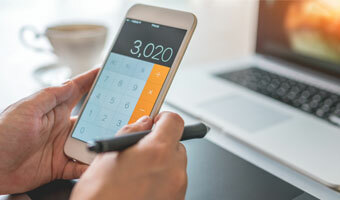 Check out our handy-dandy calculators to help you determine if a purchase loan or refinance option is best for you. Of course, you can always speak with your trusted Waterstone Mortgage loan professional (that's what we're here for, after all!) But it's nice to be able to get some initial numbers to give you an idea of what to do next. To buy or not to buy - that really is the question. Use our Rent vs. Own Calculator to determine whether or not purchasing a home is the best decision for you. Depending on your life circumstances and financial situation, one may be clearly better than the other, but it's up to you to decide! Check out this calculator to compare what your long-term costs will be if you rent or buy. How much will my monthly payments be if I decide to buy a home? Should I refinance my current home loan? Refinancing can be a great way to save money if the current interest rate is lower than it was when you first purchased your home. Our Refinance Break-Even Calculator can help you determine if the initial closing costs will be lower than the amount you'd pay in interest over time had you not refinanced. This will help you determine if it's the right option for your situation. How much money can I save if I decide to pay more than my required monthly mortgage payment? If you choose to pay more than your required monthly mortgage payment, not only will you decrease the time it takes to pay off your mortgage, but you'll also reduce your interest costs. To calculate the exact amount you could save, try our Prepayment Savings Calculator.